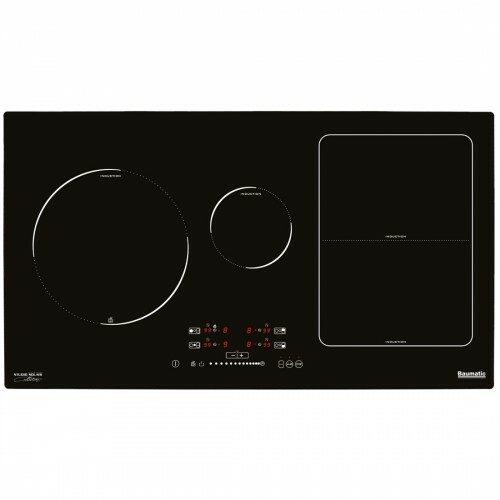 Our top of the range 90cm induction cooktop with all the features you would expect to help take your cooking up a level. All the benefits of an induction cooktop but with maximum cooking flexibility. This cooktop has 4 cooking zones and one expandable zone which enables you to cook a large pan over the flexible zone or have two separate pots on the boil at the same time. Responsive induction technology using touch slide controls mean adjustments to temperature are immediate and precise. Burning a meal and spill overs will be a thing of the past. Clean ups are as easy as a wipe over as it is the pot that is heated rtaher than the cooktop - no more burnt food to scrape off.